San Diego Restaurant Week returns in September, and with it comes the 2nd Annual #SDRWTaste2013, a premier tasting event to kick off the start to San Diego Restaurant Week (and one of our favorite events of last year)! 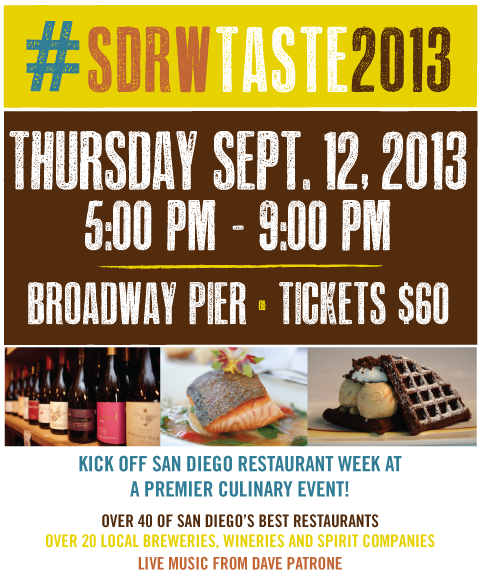 #SDRWTaste2013 is an exclusive first look at what San Diego Restaurant Week September has to offer, which will take place during the week of September 15-20, 2013. 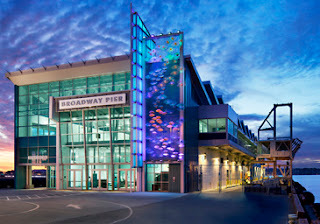 #SDRWTaste will take place on Thursday, September 12, 2013 from 5:00-9:00 PM at the picturesque Port Pavilion at the Broadway Pier, where people from all over San Diego will gather to celebrate San Diego Restaurant Week and indulge in some of the finest foods and beverages! From sizzling steaks, to sensational salads and pastas, this event will have it all! There will even be scrumptious snacks and delightful desserts to tempt your taste buds. Don't forget to wash it down with a glass of wine or a chilled beer as specialty beverages will be paired with each food sample to provide the ultimate tasting experience! Chefs and beverage purveyors have teamed up to design the best combination of food and drink for your palate, so treat yourself to this exquisite event and be the first to take a bite out of San Diego Restaurant Week! Interested in receiving a FREE ticket to #SDRWTaste2013? San Diego County MINI Dealers will join the event as a Title Sponsor for 2013 and are offering a FREE ticket to anyone who test drives a MINI at MINI of Escondido or MINI of San Diego. In addition San Diego County MINI Dealers will be on-site at #SDRWTaste2013 giving guests an up close look at the vehicles fun and sporty designs. This program is while supplies last only so don’t miss out on a FREE test drive and FREE ticket into one of the tastiest events of the season. Make sure that you take part in this exclusive first taste of San Diego Restaurant Week on September 12, 2013! Tickets to the event will be sold at $60 each and part of the proceeds will be given to the Jacobs & Cushman San Diego Food Bank and Mama’s Kitchen, the two charity partners of San Diego Restaurant Week that support and help better our community. Visit San Diego Restaurant Week on the web at SanDiegoRestaurantWeek.com for more information and to purchase your tickets to this premiere tasting event!